Palestinian Arab woman armed with two knives caught near the Cave of the Patriarchs. 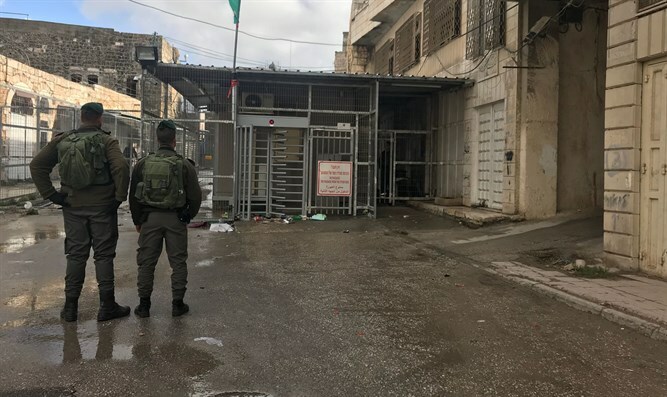 Border Police officers on Friday afternoon arrested a Palestinian Arab woman who was armed with two knives near the Cave of the Patriarchs in Hevron. The Border Police officers asked the woman to undergo a security inspection when she tried to escape the checkpoint. The officers arrested her and asked her to reveal the items she had been carrying. The suspect, who took out a knife, was asked by one of the officers to empty her bag, and when she did, another knife fell to the floor. The Border Police said that the circumstances of the incident and the knives found in the woman’s possession indicate that she was planning to carry out a stabbing attack. The suspect, a resident of Idna in her 30s, was transferred for further interrogation by the security forces. Earlier on Friday, an IDF soldier in his 20s was lightly injured when a vehicle rammed into him near the Qasr el Yahud baptism site, not far from the Allenby Bridge connecting Jordan and Israel. The soldier was treated at the scene and did not require hospitalization. The Arab driver was taken for questioning. Initial investigations found that the car which rammed him continued driving before coming to a stop.